The French Republic has 60 million inhabitants, living in the 22 regions of metropolitan France and four overseas departments (1.7 million). Despite the fact that the population is growing slightly (up 0.4% a year), the number and proportion of young people under 25 are, however, falling: there are now fewer than 19 million of them in metropolitan France, i.e. 32% of the total population, compared with 40% around 1970 and 35% at the time of the 1990 census. France is seeing a slow aging of the population  less marked however than in other neighbouring countries (Germany and Italy), especially as the annual number of births is currently increasing slightly. 15 million pupils and students, i.e. a quarter of the population, are in the education system. Just over 2 million are in higher education. In 1999, France's GDP was close to FF 9,000 billion (EUR 1,330 billion), i.e. FF 150,000 (EUR 22,000) per inhabitant. Of this total, just over FF 600 billion (EUR 95 billion) were devoted to initial or continuing education: 7.2% of GDP. As far as school education spending is concerned, France is in a middle position, behind the Nordic countries (Sweden and Denmark), but fairly significantly ahead of Italy and Japan. France has a workforce today of 26 million, of whom fewer than 2 million are unemployed: the unemployment rate recently fell to below 9%. 6% of the labor force (about 1.5 million jobs, including 1 million civil servants and local government officers) are undergoing training. Around 13 million pupils attend school in France. The system is a unified one, whose present general structure (primary schools, collèges, lycées) was gradually put in place during the 1960s and 1970s, ending the formerly more compartmentalized system which was based on a clear separation between primary and secondary education. Since the 1970s, France has also had an outstanding record with respect to the development of pre-school education; all 3- to 5-year-olds can go to nursery classes. Since 1967, school attendance has been compulsory for those from 6 to 16 years of age. France has 60,000 primary schools catering to pupils during their first five years of formal education: the first three years (CP - cours préparatoire - and CEl/CE2 - cours élementaire 1 and 2) provide a grounding in the basic skills. The next stage - CM1/CM2 (cours moyen 1 and 2) takes the children up to the end of primary school. Secondary schooling is divided into two successive stages, known as cycles. From 11 to 15 years, almost all children now attend a collège, taking them from form 6 (sixième) to form 3 (troisième) (1). Since 1975 there has been a single mixed-ability collège for all pupils regardless of their level of achievement. After form 3, they move onto a general, technical or vocational lycée. These prepare pupils for the corresponding baccalauréat examinations (referred to as le bac), which they normally take at the age of 18. Decisions about pupils (repeating years, moving up to a higher class, changing course) are taken through a procedure involving a dialogue between the school (teachers, administrative and ancillary staff) and the families and pupils. Although the teachers give their opinions in what is known as a "class council"  consisting of representatives among pupils, teachers and parents  parents can appeal against a decision and demand (depending on the pupil's level) that the pupil move up rather than repeat the year, or repeat the year rather than do a course they do not wish their son or daughter to pursue. In every school, there are specialist counsellors to help pupils, parents and teachers resolve any problems they may encounter. 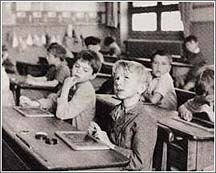 Today, form 3 (which is the final year at collège) is the first point at which children have a choice regarding some of the subjects they wish to study, and the direction they would like their curriculum to take (although they must choose a foreign language in form 6, and another in form 4). The vast majority of pupils attend schools which are overseen by the Ministry of National Education. However, around 100,000 (suffering from various disabilities) go to special schools run under the aegis of the Ministry of Health, and 200,000 go to agricultural lycées (technical and vocational courses). Finally, 300,000 others, aged 16+ undergo apprenticeships (work contracts), which  since the 1987 reform  can prepare them for all types of vocational qualification. Alongside the ordinary school education system, there are also specialist or adapted classes, which are often integrated into primary and secondary schools. Such programs include the CLIS  classes which act as bridges to bring children back into the mainstream system, and the SEGPA  adapted general and vocational education sections designed particularly for children and adolescents having difficulty at school due to psychological, emotional or behavioral problems, and for slow learners. Similar curricula are also found in special schools, particularly those under the aegis of the Health Ministry. The aim is to get these children (around 5% of the pupils in any one year group) to achieve a minimum skills level: the CAP (certificat d'aptitude professionnel), which sanctions training in a specific vocational skill. Schools managed under the aegis of the National Education Ministry may be public or private. The private sector educates approximately 15% of primary school and 20% of secondary school pupils, percentages which have remained stable over the past decade. The bulk of private schools are Catholic, having contracts with the State (which inter alia pays their staff salaries). Families of the fewer than 50,000 pupils in private schools without such contracts pay high fees.